So, the good people (???) at Media Matters For America (a Liberal hate group, which spreads misinformation nationwide) have been carrying on a “grass-roots” smear campaign against Rush Limbaugh‘s radio show, trying to intimidate local businesses from advertising on Rush’s syndicated radio show (which is run on 600 radio stations). Over here, the Heritage Foundation has an excellent story on the futile effort the Liberals are carrying on, to deny Rush his advertisers, and thus revenue for the EIB Network. 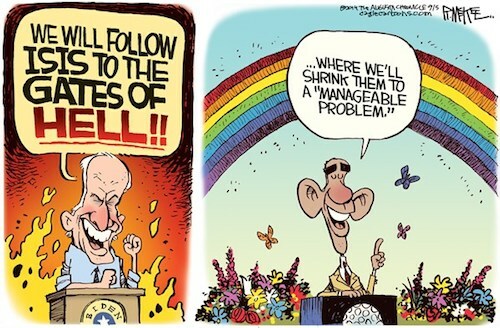 Funny thing…it isn’t working! As Rush has said many times, advertisers are clamoring to be on his show, both locally and nationally. Since the very beginning in the late 1980’s, Rush’s show has been the go-to place for businesses to promote themselves. Rush’s listeners are about the most loyal there are, and we support Rush’s advertisers. Heritage did some research, and found that the majority of anti-Rush Twitter messages were coming from about ten Media Matters henchmen, most from out of the state which they were targeting. Liberals have always said that they supported the “little guy”, but actions speak louder than words. In this media smear campaign, they are trying to deny local small firms the Limbaugh national advertising platform. Not in small business’s best interests. Well, Rush has many enemies, and they have not stopped him yet. My bet, as a RushBabe, is that they never will. My money is always on the Truth, and on my hero, Rush Limbaugh! EDIT, on November 10. Here’s a link to a Fox News story. It seems that Mr. Limbaugh has threatened to sue the DCCC for defamation. GO RUSH!! If you are one of the majority of Americans who gets their news from what is commonly called the “mainstream media” (NYTimes,WAPo,ABC,NBC,CBS,CNN…), then you are NOT getting news. You are getting opinion. OTL’s approval ratings are low, and going lower. The RCP Poll AVERAGE is Approve: 41.2%, Disapprove: 53.8, a spread of Negative 12.5%. Way back in the distant past, when President GW Bush’s ratings were low, the media harped on it all day and night long, contributing to the low ratings! Now, when their own creation is tumbling in the ratings, nary a peep! Watchdog? Nope! 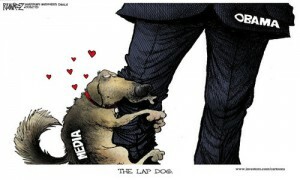 More like lapdog (see cartoon above). In a “generic election” poll, where respondents were asked if they would vote for a Democrat or Republican ticket, 42.7% of respondents said they’d vote a Democrat ticket, and 46.2% said they’d vote a Republican ticket, giving the R’s a 3.5% advantage! Do you hear about this in the media? Nope! It had been over two years since our sleek, black kitty had been to the vet for a well-pet exam. I wanted her to meet Doctor Lora, the vet who just happens to be the daughter of my best friend. And miraculously, she was scheduled to be working on Saturday! So I washed the towel for the pet-carrier; threw in Kikyo’s favorite catnip toy, and managed to stuff her into her carrier for the drive to Cats Exclusive. Needless to say, she was not exactly thrilled to be shut into a plastic carrier with a mesh door, and carried out to the car. In fact, she protested vocally, all the way to the vet’s office. I talked to her and tried to reassure her that nothing bad would happen, but it’s really hard to reason with a cat. We arrived in time, checked in with the front desk, and sat down in the comfortable lobby to wait to be called. On the floor across from us was another similar-sized pet carrier, with a very calm big gray cat inside, who didn’t utter a peep. After a few minutes, the technician called her name, and we followed into a neat exam room. I opened the door of the carrier, but Kikyo did not want to come out. It took the tech’s holding the carrier upside-down to make her come out. Once out, Kikyo wandered around the room, meowing and sniffing out the unfamiliar space, while the tech asked me all the usual questions about how she was doing, whether she had any health issues (nope), and what she ate. The tech managed to pick her up to put her on the nice digital scale to get her weight, but kitty did not want to sit still! The tech was very gentle, and managed to get Kikyo to sit still long enough to get her weight, which was pretty close to what it had been the last time. Our kitty gets lots of exercise, and we don’t over-feed her, so she’s pretty svelte. The tech finished the preliminaries, so she left to go get the doctor. While we waited, kitty wandered around the exam room, exploring every nook and cranny, and getting dust on her nose. I picked her up, and placed her on the bench beside me, where she sat up and walked on the narrow ledge-she is really fearless!. Dr. Lora finally arrived, and she conducted a very thorough exam, checking her eyes, ears, and teeth, and holding her tightly to feel her internal organs. The verdict: One young, healthy, pretty cat. Lora was glad to finally meet her, and she complimented Kikyo on her beautiful soft black coat. She told me that my cat was in great health, and that I was feeding her the right food in the correct amounts. She said that our cat looked and acted young, even though she’s about five years old now. And the doctor said that Kikyo was a pleasant interlude in a day that had been filled with very sick kitties. Dr. Lora is a great vet, and it’s worth it for me to take Kikyo a few miles out of our way to see her at her clinic that treats only cats. And they have something for people too, their “Store for Cats” where you can buy all kinds of toys, food, leashes, and cat furniture. They even have a good selection of cat greeting cards! All that was left was to give her a vaccination against feline distemper, which now comes in an “intra-nasal” form; and to clip her claws. Kikyo really doesn’t like to have her feet touched, so when I take her to the vet, I have them do it. The tech came back and gave her the vaccination, and I held her while the tech clipped her “points”. And it was time to go home. Funny, after her exam, it was no trouble at all to get her back into the carrier for the trip home. We stopped by the front desk to pay, and we were off again. She still wasn’t too happy to be in the car, but she didn’t protest too much. And once we got home, she came right out of the carrier and demanded dinner. Cats have NO short-term memory! And I was glad to get a clean bill of health for our beautiful cat, who more than pays for her upkeep with soft fur, and loud purrs. Everyone should be owned by a cat. If you visit my YouTube site, you can watch a video I took with my old Flip Video camera, just after we brought her home in July of 2010. Which of These Presidential Statements Doesn’t Belong? 1. “The only thing we have to fear is fear itself”. 2. “Don’t ask what your country can do for you, ask what you can do for your country”. 3. “Mr. Gorbachev, tear down this wall”. 4. “We don’t have a strategy yet”. Which Commander in Chief would YOU want to follow into war against a ruthless enemy?